I've mentioned "Hope" (the sculpture) a few times in recent posts, so here's a photograph of what she looks like. Quite charming, I think. Hope, a CherryLion Studios creation, is on the grounds of the Jimmy Carter Presidential Library and Museum in the Rose Garden. That particular capture was made recently, after cooler weather set in, but during the spring and summer the garden is spectacular. 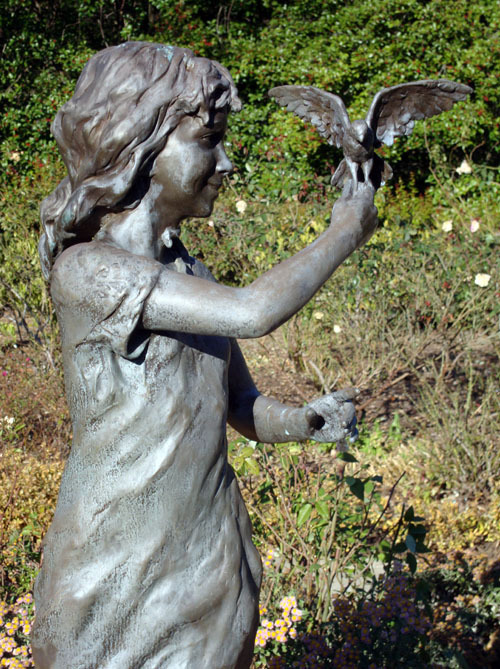 There are several sculptures on the Carter Center's grounds and the Museum is a must-see. It's the only presidential museum I've been to, but I can imagine it holds its ground in prestige...it's really that remarkable. And President Carter himself is there from time to time...I had the pleasure of meeting him (for the second time) at a book signing only a couple of months ago at the Carter Center. There are a number of book signings and other events that take place at the Carter Center throughout the year.